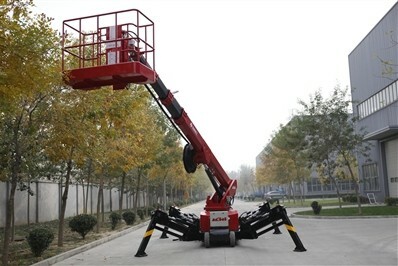 JCHI work platform-spider boom lift GTBY22S is compact, light and easily moved working platform. It is safe and reliable, equipped with dual power (engine and electromotor), supported by four outriggers while working. Its good for indoor work in that light machine could not damage building and outdoor work of building cleaning and maintenance. The spider boom lift is compactly stowed and can pass through narrow passageway and turn.